One of the defining features that stands above the otherwise budget nature of the Galaxy Tab 3 7.0 is its SIM card slot. It not only gives you full-blown voice calling and messaging, it'll even do 3G video calls with the front-facing VGA camera. You could use either the loudspeaker or a headset to make your calls. If you prefer, you can even place the Galaxy Tab 3 7.0 next to your ear and still manage to make a call thanks to the earpiece (there's even a proximity sensor), although you'll look rather ridiculous doing so. Picking a contact to call is fairly easy - you have smart dial, a call log if you need to call someone back and Favorites, which display large tiles with the photos of your favorite contacts. Voice dialing is enabled too. 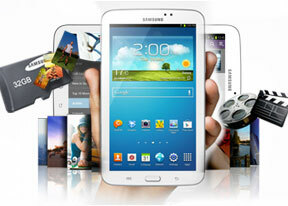 Contact management is straightforward on the Samsung Galaxy Tab 3 7.0. Your contacts get automatically synced with your Google account (other accounts too, as well as social networks and IM profiles) unless you explicitly disable this feature. Contacts are displayed using a two-column interface that's present in several other key apps and really puts all the screen estate to good use. The left column lists all the contacts, with the contact info on the right. Samsung is well known with its great video players and the Galaxy Tab 3 7.0 is no exception. The video players offers several view modes - grid, list, folders and nearby devices (which accesses DLNA devices). The grid view shows 8 thumbnails of videos at a time (they aren't live video thumbnails, sadly), while the list view gives you a better overview of all the files that are stored on the tablet. Somewhat surprisingly, considering the modes chipset, the video player had absolutely no trouble with any of the files we threw at it - starting with WMV all the way to AVI (DivX and XviD), as well as MPEG4 and MKV (H.264). Resolution wasn't a problem either - the Samsung Galaxy Tab 3 8.0 played FullHD files without a problem. The Samsung Galaxy Tab 3 7.0 also made a good impression when it offered a list of subtitles and let us pick. It scans for all subtitles, so the file doesn't have to have the same name as the video. It can also play embedded subtitles within MKV files. The video player on the Tab 3 7.0 supports Pop up play - it moves the video in a small floating window and you can use other apps on the phone while still watching the video. You can use pinch zoom to adjust the size of the video.